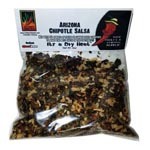 ARIZONA CHIPOTLE SALSA MIX - Our Red Jalapeño Chipotle with dehydrated Tomatillo, herbs and spices. ARIZONA RED HOT SALSA MIX - The name says it all, a zesty combination of Red Jalapeno Chipotle, Orange Habanero, herbs and spices. ARIZONA GREEN JALAPEÑO CHIPOTLE SALSA MIX - Delicious smoked Green Jalapeños, Tomatillo, herbs and spices.